Marleigh McVeigh and Jessica Oktober along with a few others, run the Cleveland Area Paranormal Society. CLEVELAND — Marleigh McVeigh and Jessica Oktober along with a few others, run the Cleveland Area Paranormal Society . "We consider ourselves spooky community outreach so we want to hear about your ghost stories," Oktober said. They've been running paranormal tours and ghost hunts since last year. "Since I am the resident supernatural witch of my friend group, I told everybody that I would take them on ghost tours. So I posted that on Facebook and then a bunch of people that I did not know bought the tickets and it sold out in about five hours," McVeigh said. Just a few weeks ago they decided to add a retail element to the spooky. Now you can go to their storefront in Lakewood and have your tarot cards read, buy tarot cards for yourself or pick up all kinds of weird books and even dowsing wands. "Really what we do is we spend a lot of time on the internet looking for the weirdest stuff that we can find that we've never been able to see in a store, and then we throw it in the store," McVeigh said. They've picked a good spot for the store. Lakewood is filled with odd shops and creepy stores and they fit right in, but weird knickknacks isn't all they offer. "I'm the resident artist so I do the sculpting classes, and the wood burning classes and the painting classes, and Marley teaches about tarot. How to use tarot for paranormal investigating, how to read tarot," Oktober said. 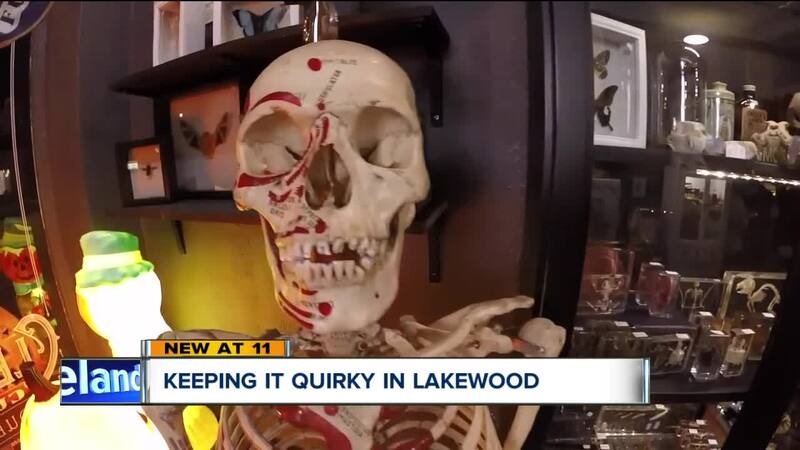 They say so far the quirky Lakewood community has embraced them, and they can't wait to see what the future holds. "The main point of Cleveland area paranormal society is to explore Cleveland and to give back to Cleveland so that we have a place to keep exploring," McVeigh said.